So, a friend of mine asked my help with a developing problem he encountered: he had a listview in a listview but in the code behind, he could not access the nested listview. Since I ran into this problem once myself and forums are loading with the same question, it seemed like a good idea to write a blog post about it for those who encounter this issue in the future! Let's start by explaining why the nested listview is not accessible. I also have a nice example set up for you to show you how it's done. So, most importantly, why is the nested listview not accessible in the code behind like the parent listview? Well, it's quite logical actually: the parent listview is a unique control that you can access from the code behind using the id just like you can with any other type of control. The difference with the nested listview however is that this listview is not unique... You put it in a listview so it occurs for each item in the listview! If you want to access the nested listview, you'll have to use the specific item that holds the listview that you want to edit! As you can see, we have two listviews one placed in the item template of the other. They both have labels in their item template as well. That's all, I hope this example helps you understand the issue and that's it's actually not an issue at all but quite a logical consequence of the listview structure. Interesting post, but unfortunately, this does not solve my issue. Maybe you can help. I will appreciate it. I like to copy the value, which is retrieved in a textbox, which is inside a ListView control, when the page finish loading and retrieving data from an XML file, to another textbox, which is outside the ListView control. Any idea how to do this ? 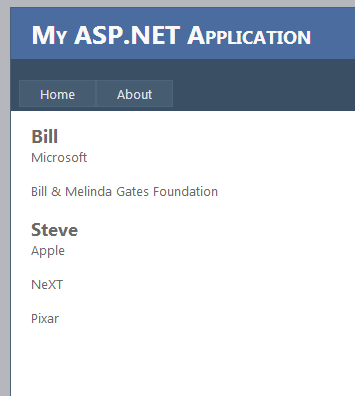 This post should help you with the first part of your question (a textbox inside a listview), for the second part maybe this can help: http://stackoverflow.com/questions/7119806/c-sharp-reading-data-from-xml. I hope this helps, if not, let me know!